Beneath the MOTIF's control panel is an array of tactile switches soldered to PC Boards. When you push a button on the panel, it pushes on the stem of one of these tact switches. When a switch's electrical contacts start to wear out, you have to press harder on the plastic button to make the switch conduct. Eventually the tact switch won't work at all. The plastic button, which is a separate part, can also break if you press too hard on it. This repair story shows you how to remove and replace worn-out tactile switches in a Yamaha MOTIF. There are 3 Switch PCBs. The Right board holds the data dial and all the tact switches right of the display. 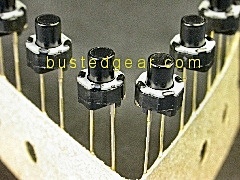 Pull off the dial knob before removing the Right PCB. The Left PCB holds all the switches left of the display plus 5 sliders and 4 rotary knobs. 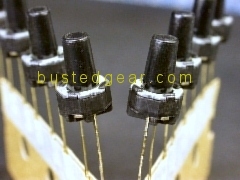 Pull off the slider and rotary knobs before removing the PCB. The Center PCB holds the switches for the buttons under the display. 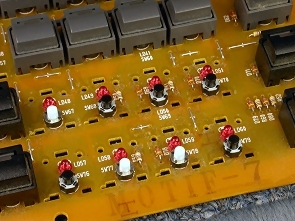 Before removing the Switch PCBs, refer to the MOTIF6-7 Disassembly story. It shows you how to remove the computer cage and keyboard assembly, which must come out before the Switch PCBs do. First, test each button many times on several days. A switch that misses even one push should be changed while its board is removed since this job takes time. Lighting and Non-Lighting buttons use different Tact Switches. Yamaha® is a registered trademark of The Yamaha Corporation.